W2W — 3 men, 3 road bikes, 3 days! 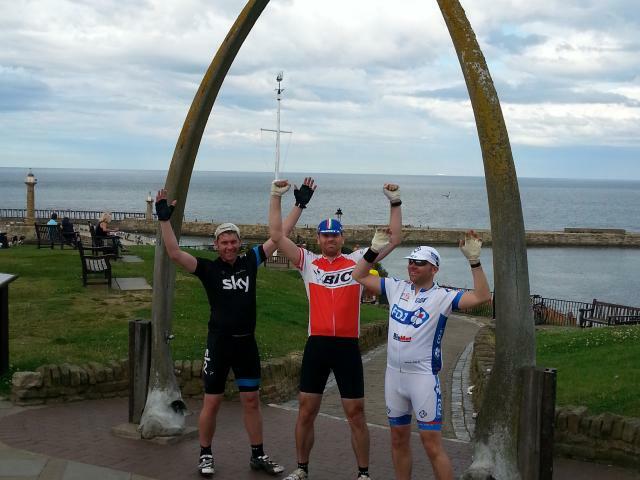 3 men, 3 road bikes, 3 days! Three of us decided to ride from Walney to Whitby on road bikes carrying our luggage in rucksacks with planned detours for the off-road sections. I was initially worried about booking bikes on the train as transpennine only allow two reservations and there were three of us! Catching the 06:30 hrs train from Manchester Oxford Rd we had no problems, at one point there were six bikes in the carriage. We broke up the route into three 60 mile days, staying in Orton the first night and Darlington the second. The first day was horrifically hilly though stunning scenery and we coasted for the final thirty miles. We avoided the track in Greenodd having to loop around the A590. We stopped in Oxenholme for much needed refreshments. We left Walney at half nine and reached Orton at half six. Day two was lovely and flat to Kirkby Stephen compared to the previous day. We joined a peloton of mountain bikers also cycling the route. The hills returned after the Tan Hill, 6.5 miles signpost although it was no way near as bad as expected. The scenery is amazing once you're almost at the top of the moor. After Tan Hill, which is a brilliant place to stop, there's an off road section, unfortunately on racing bikes you have to continue along the road losing a lot of height before climbing back over the moor to head to Barnard Castle. When we left Tan Hill the mountain bikers were only halfway through their meal, by the time we reached Barnard Castle they were already there yet had suffered a puncture! Barnard Castle seemed a lovely market town with a nice river and castle. The remaining ride to Darlington was flat. We left Orton at ten and reached Darlington at half five, having stopped at Tan Hill for close on two hours. On day three as we cruised from Darlington to Great Ayton and if you'd asked me if I'd have done things differently I'd have suggested staying in Kendal on day one and Barnard Castle on day two. It was a hard first forty miles on day one and Barnard Castle offered multiple real ale pubs (and 60 miles from Kendal). Suddenly the Yorkshire Moors hit us. Again stunning scenery though energy sapping steep hills. The hills avoiding the off road section from Commondale to Castleton, out of Danby and a few miles before Commondale(25%) stick in the memory! There's an off road section at Aislaby that we didn't know about, even with a mountain bike it would be a struggle though only a ten minute downhill walk along a bridleway, consulting a map it could be avoided. After this it was plain sailing until a disused railway line that leads you into the centre of Whitby, again this can easily be avoided if you follow the road and take the bridge at the foot of the Abbey. We left Darlington at ten and entered Whitby just before five. upkeep them. It's very rewarding though far harder than the Way of the Rose and Transpennine way that I've also ridden. I'd encourage people to do this route, the main advice I'd offer is travel as light as possible, carry lots of fluids in warm weather and use panniers rather than rucksacks. The route is probably more suitable for a hybrid bike than a road bike but with a few detours we felt that the track after Tan Hill is the only place we were at a disadvantage. I'd say people with wider tyres would have envied us for the majority of the route.